New observations made with ESO’s Very Large Telescope are making a major contribution to understanding the growth of adolescent galaxies. In the biggest survey of its kind astronomers have found that galaxies changed their eating habits during their teenage years – the period from about 3 to 5 billion years after the Big Bang. At the start of this phase smooth gas flow was the preferred snack, but later, galaxies mostly grew by cannibalising other smaller galaxies. Astronomers have known for some time that the earliest galaxies were much smaller than the impressive spiral and elliptical galaxies that now fill the Universe. Over the lifetime of the cosmos galaxies have put on a great deal of weight but their food, and eating habits, are still mysterious. A new survey of carefully selected galaxies has focussed on their teenage years — roughly the period from about 3 to 5 billion years after the Big Bang. By employing the state-of-the-art instruments on ESO’s Very Large Telescope an international team is unravelling what really happened. In more than one hundred hours of observations the team has collected the biggest ever set of detailed observations of gas-rich galaxies at this early stage of their development . “Two different ways of growing galaxies are competing: violent merging events when larger galaxies eat smaller ones, or a smoother and continuous flow of gas onto galaxies. Both can lead to lots of new stars being created,” explains Thierry Contini (IRAP, Toulouse, France), who leads the work. The new results point toward a big change in the cosmic evolution of galaxies, when the Universe was between 3 and 5 billion years old. Smooth gas flow (eso1040) seems to have been a big factor in the building of galaxies in the very young Universe, whereas mergers became more important later. 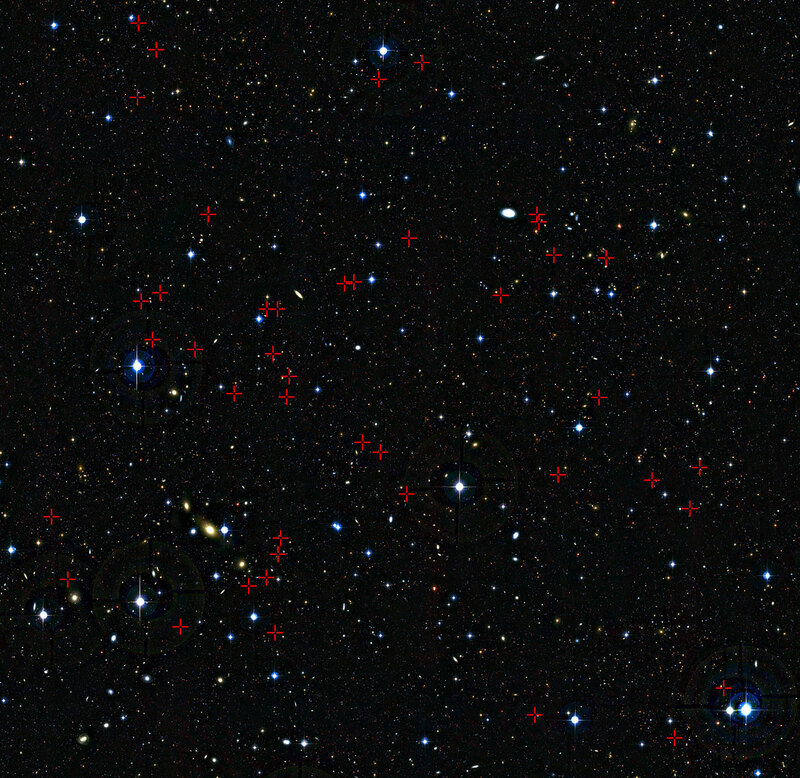 Distant galaxies like the ones in the survey are just tiny faint blobs in the sky, but the high image quality from the VLT used with the SINFONI instrument  means that the astronomers can make maps of how different parts of the galaxies are moving and what they are made of. There were some surprises. The team are only just starting to explore their rich set of observations. They plan to also observe the galaxies with future instruments on the VLT as well as using ALMA to study the cold gas in these galaxies. Looking further into the future the European Extremely Large Telescope will be ideally equipped to extend this type of study deeper into the early Universe. The name of the survey is MASSIV: Mass Assembly Survey with SINFONI in VVDS. The VVDS is the VIMOS-VLT Deep Survey. 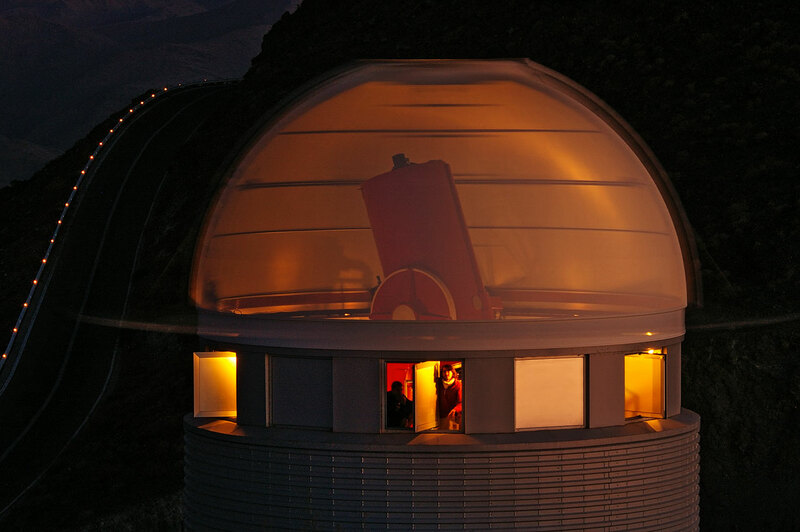 VIMOS is the VIsible imaging Multi-Object Spectrograph, a powerful camera and spectrograph on the VLT that was used to find the galaxies used in the MASSIV work, and measure their distances and other properties. SINFONI is the Spectrograph for INtegral Field Observations in the Near Infrared. It is the instrument on the VLT that was used for the MASSIV survey. SINFONI is a near-infrared (1.1-2.45 µm) integral field spectrograph using adaptive optics to improve the image quality. An international team of astronomers has used the brief but brilliant light of a distant gamma-ray burst as a probe to study the make-up of very distant galaxies. Surprisingly the new observations, made with ESO’s Very Large Telescope, have revealed two galaxies in the young Universe that are richer in the heavier chemical elements than the Sun. The two galaxies may be in the process of merging. Such events in the early Universe will drive the formation of many new stars and may be the trigger for gamma-ray bursts. Gamma-ray bursts are the brightest explosions in the Universe . They are first spotted by orbiting observatories that detect the initial short burst of gamma rays. After their positions have been pinned down, they are then immediately studied using large ground-based telescopes that can detect the visible-light and infrared afterglows that the bursts emit over the succeeding hours and days. One such burst, called GRB 090323 , was first spotted by the NASA Fermi Gamma-ray Space Telescope. Very soon afterwards it was picked up by the X-ray detector on NASA’s Swift satellite and with the GROND system at the MPG/ESO 2.2-metre telescope in Chile (eso1049) and then studied in great detail using ESO’s Very Large Telescope (VLT) just one day after it exploded. 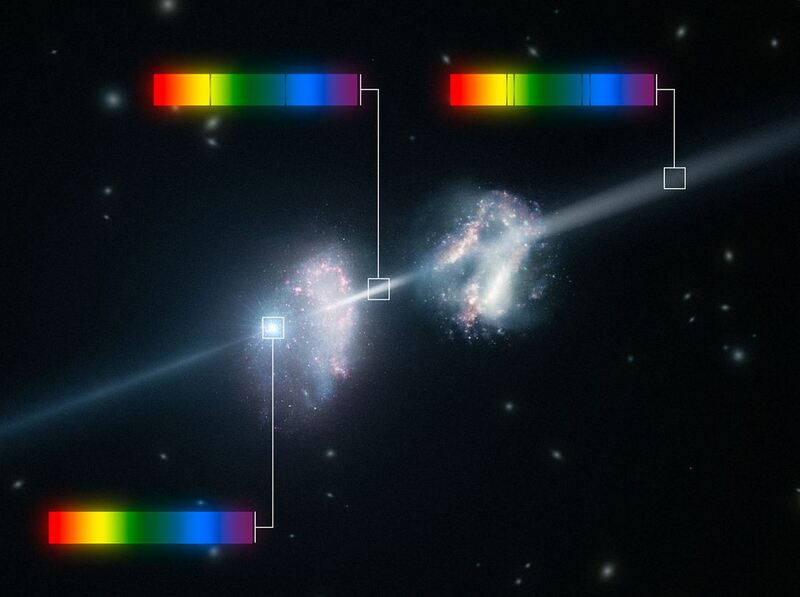 The VLT observations show that the brilliant light from the gamma-ray burst had passed through its own host galaxy and another galaxy nearby. These galaxies are being seen as they were about 12 billion years ago . Such distant galaxies are very rarely caught in the glare of a gamma-ray burst. 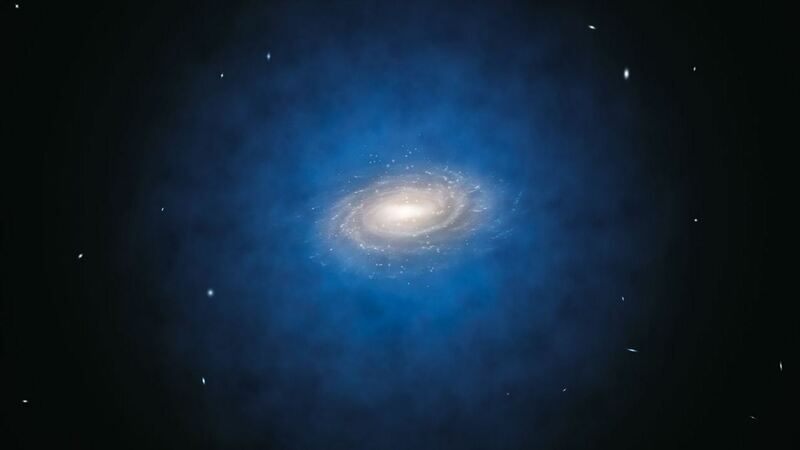 It is expected that galaxies in the young Universe will be found to contain smaller amounts of heavier elements than galaxies at the present day, such as the Milky Way. The heavier elements are produced during the lives and deaths of generations of stars, gradually enriching the gas in the galaxies . Astronomers can use the chemical enrichment in galaxies to indicate how far they are through their lives. But the new observations, surprisingly, revealed that some galaxies were already very rich in heavy elements less than two billion years after the Big Bang. Something unthinkable until recently. Energetic star formation in galaxies like these might have ceased early on in the history of the Universe. 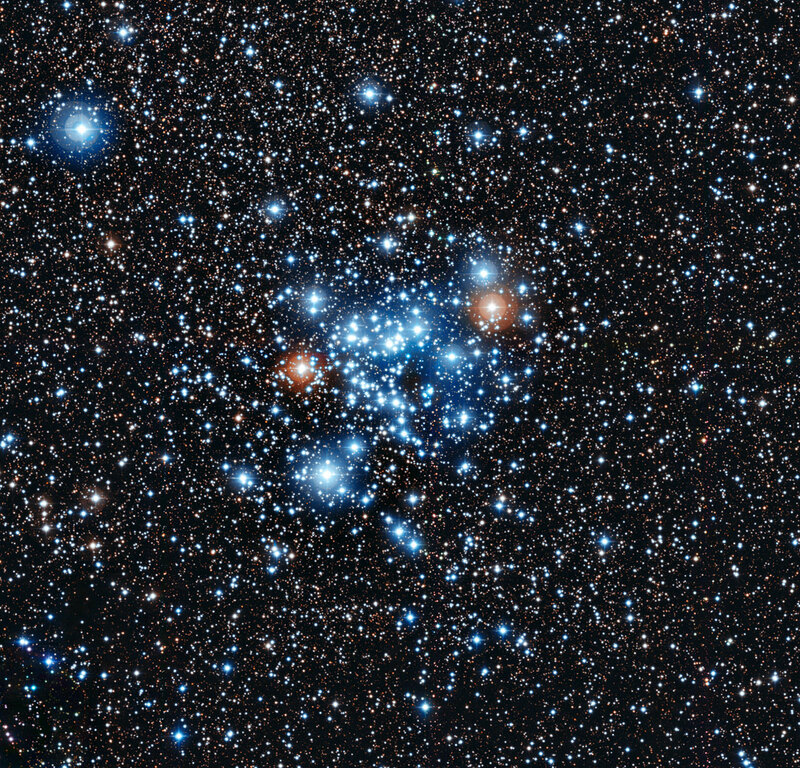 Twelve billion years later, at the present time, the remains of such galaxies would contain a large number of stellar remnants such as black holes and cool dwarf stars, forming a hard to detect population of “dead galaxies”, just faint shadows of how they were in their brilliant youths. Finding such corpses in the present day would be a challenge. Gamma-ray bursts lasting longer than two seconds are referred to as long bursts and those with a shorter duration are known as short bursts. Long bursts, including the one in this study, are associated with supernova explosions of massive young stars in star-forming galaxies. Short bursts are not well understood, but are thought to originate from the merger of two compact objects such as neutron stars. The name refers to the date on which the burst was discovered, in this case it was spotted on 23 March 2009. The galaxies were seen at a redshift of 3.57, meaning that they are seen as they were 1.8 billion years after the Big Bang. The material produced by the Big Bang, 13.7 billion years ago, was almost entirely hydrogen and helium. Most heavier elements, such as oxygen, nitrogen and carbon, were produced later by thermonuclear reactions inside stars and fed back into the reserves of gas within galaxies as these stars die. So, it is expected that the amount of heavier elements in most galaxies gradually increases as the Universe ages. Scientists have used ESO’s Very Large Telescope to probe the early Universe at several different times as it was becoming transparent to ultraviolet light. This brief but dramatic phase in cosmic history — known as reionisation — occurred around 13 billion years ago. By carefully studying some of the most distant galaxies ever detected, the team has been able to establish a timeline for reionisation for the first time. They have also demonstrated that this phase must have happened quicker than astronomers previously thought.